Fun holiday themed scavenger hunt lists for holiday scavenger hunts. 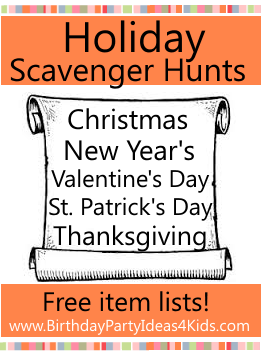 Free item lists to print out for each of these scavenger hunts. Basic Scavenger Hunt Rules: Holiday scavenger hunts are played the same as a neighborhood scavenger hunt. To avoid teams going to the same house give each team a section of the neighborhood or if there are only 2 teams give one team the odd numbered houses and the other team the even numbered houses. Once the items are collected the first team back to the house within a certain time limit wins. We usually set ours for 90 minutes. The teams who get back late are given a penalty - 1 item for every 5 minutes they are late. For items that are harder to find you can assign bonus points before the game begins. 2 to choose from and 8 mall scavenger hunts. Happy Birthday World! Use this free scavenger hunt list for your New Years Eve Scavenger Hunt. We've listed 20 fun New Years Eve related items to find! The New Year's Eve Scavenger Hunt List is free to print out. Enjoy! 27 fun items to find that relate to Christmas. The Christmas Scavenger hunt item list is free to print out.